When will “making a touch” determine who wins? When can you play rugby without having to tackle? With 6 people per team working equally hard on the field and only 20 minutes to make it count, Touch Rugby is a sport that requires an amalgamation of stamina, speed, strength and soul. 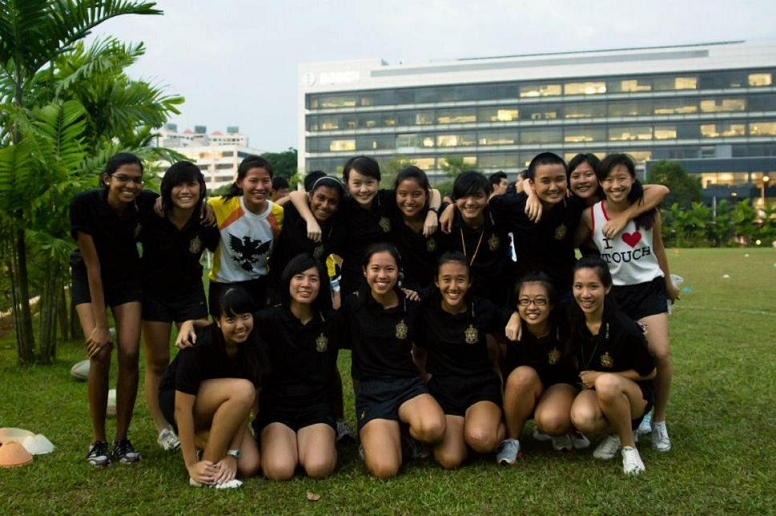 Getting well-toned legs, staying fit and healthy and having a chance to chalk up points for the Raffles Diploma (Sports & Health Domain) may be a few perks you associate with this CCA. However, putting the tangible aside, joining Touch Rugby is a unique experience that will benefit you and turn you into an all-rounded individual. Besides honing your mental strength, discipline and composure, you will realize how powerful team spirit and ‘telepathy’ can be. 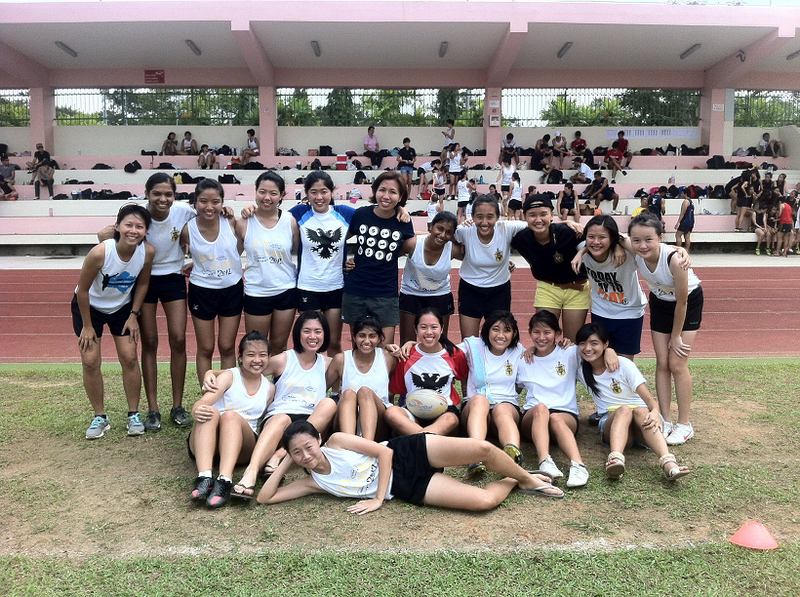 As emphasized by our coach, Mephine Ong, the team believes in having a driven attitude on the playing field. This takes a combination of excellent ball skills , as well as the ability to ‘burn’ your opponent (i.e. run through to score). Touch Rugby is very much a game of strategy and thinking on your feet. Trials to enter the CCA test one’s physical capabilities – including acceleration, ball handling and execution of basic moves, as well as mental capacities like situation awareness Training sessions, which are held twice a week, mainly focus on picking up different moves, learning to apply them in the game and practicing these strategies. These come into play when the Junior College League kicks off annually from April to June, with many other smaller competitions along the way. However, the passion for the sport does not stop when you graduate, as alumni do go on to join clubs and come back to train the current team. Coming in as strangers to the sport, everyone starts from the same page, only to achieve exponential progress as the number of training sessions increases. Apart from training, would you fancy roti prata or Island Creamery for supper? Besides monthly birthday celebrations and an annual Christmas event, lunches and suppers help the team turn from strangers to friends to a circle of trust. Having to shower to clean off the mud and wash your boots after training, especially after the rain or morning dew, creates memories and shared experiences within the team, holding everyone together in an even tighter bond. Expect it to get sweaty. Expect it to get muddy. Expect yourself, along with your comrades, to be aggressive, and driven towards a goal like never before. 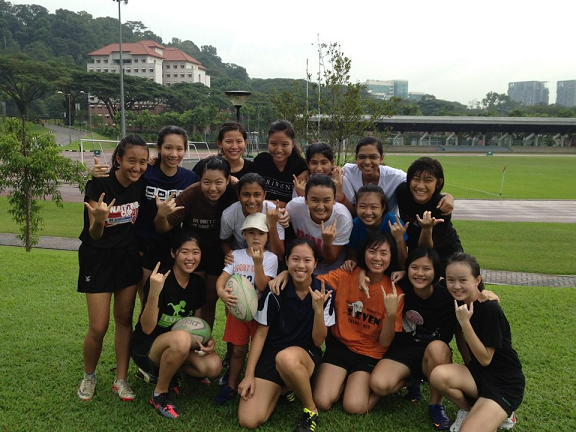 That’s Raffles Touch Rugby for you – we dare to try*.